Roborealm is hands down one of the most incredible tools available to roboticists today and amazingly it’s completely free, as in free beer! Roborealm is a vision processing platform for Windows that allows experimenters to harness basic webcams and wifi cameras for use in robotics. We’re not just talking about telepresence here, Roborealm allows you to filter and manipulate video, as well as get output variables for use in various programming languages and even built-in hardware interface modules (SSC-32 servo controllers, joysticks, etc). Many roboticists are well aware of Roborealm and all of its awesomeness, so why am I preaching to the choir here? 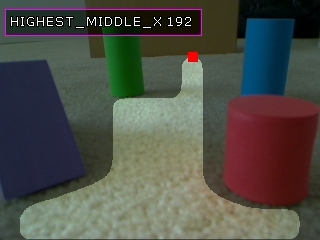 Because they recently published a tutorial on using vision for obstacle avoidance, and one look at it had my jaw dropping. Some very useful stuff here, as well as downloadable example files and code showing how to use it in a real world application. Anyone interested in machine vision and PC based robotics should definitely check this out! While Roborealm is available for free the cost associated with its development is by no means cheap, so if you enjoy the product please consider donating! Information on donating to Roborealm can be found on their site.